« *** WINNERS *** Pat and Melissa are Living the Life of Riley! CONGRATULATIONS! Puzzles hold wonderful memories for me, since I can always remember working on them together as a family when I was a child. Especially around the holidays, my mother, grandmother and I would work long and hard to complete an intricate puzzle before the holiday weekend was through. Everyone else in the house would also frequently pass along the dining room, stopping for awhile to help us before finishing what they were doing. RedEnvelope is an online store that I love shopping at for they have such a wide variety of unique products for every purpose and occasion. When they were kind enough to allow me to pick an item to review, I just knew that I would love to continue the puzzle family tradition with my own daughter, and the Personalized Puzzle from RedEnvelope was a perfect choice! Keep reading to find out why! I reviewed the Personalized Puzzle from RedEnvelope.com, which retails for $39.95. The Personalized Puzzle from RedEnvelope is actually two puzzles in one! The top portion of this puzzle is a large and vivid picture of many jungle animals peering down into a bassinet which has a bright light emanating from it. The animals are all smiling because the bassinet is representing the birth of your child, which of course is the happiest of occasions! This part of the puzzle is comprised of 25 large puzzle pieces, perfect for challenging a younger child. The bottom portion of the puzzle is the personalized part. It contains 90 smaller puzzle pieces, perfect for challenging an older child or even an adult! The great thing is that the bottom portion of the puzzle also contains your child's first, middle and last names as well as their full date of birth! Any spaces not used by their name is filled in with a host of zoo animals to complete the puzzle and tie the bottom portion of the puzzle in with the animal theme up top. The zoo animals are all the same puzzle shape, so they can fit in any combination your child sees fit, making it easier for a younger child to complete this puzzle all by themselves. There is also a bright yellow border around the puzzle and the bottom of the border contains the alphabet too. 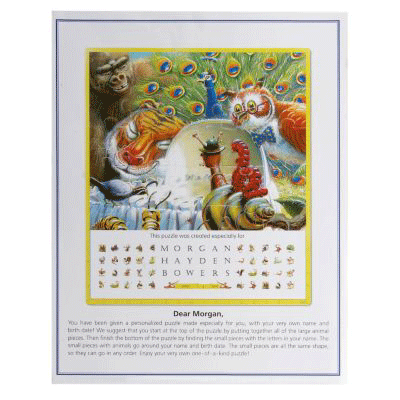 Your Personalized Puzzle also comes with a full-color gift page which contains an original message at the very top, especially for the recipient, as well as what the completed puzzle will look like. I loved that I could include my own private message to Riley, tucked inside this puzzle, for now this gift is much more sentimental and special. 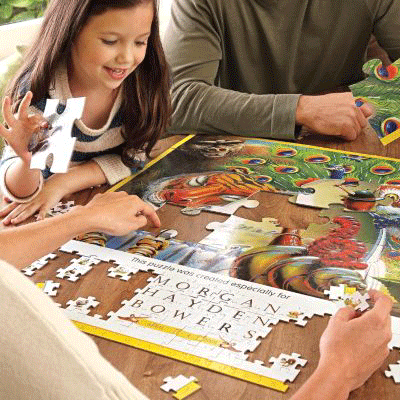 This was an extremely high-quality puzzle with thick, durable pieces and bright, vivid coloring. The gift box and personalized message insert also add to this puzzle's charm and uniqueness as a wonderful children's present. Although Riley is still too young to play with this puzzle, I can't wait until the first holiday that my mom, Riley and I all gather round the dining room table to complete her Personalized Puzzle and to continue our family's tradition! Disclosure: I received the Personalized Puzzle from RedEnvelope.com in order to facilitate my review. No other compensation was received. This product review is based on my own personal experiences with this item and is completely honest and objective.